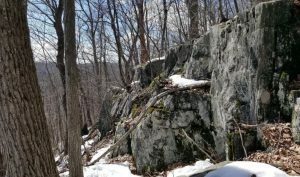 Hilltown Land Trust is partnering with Western Mass Hilltown Hikers to lead a hike up to Round Top Hill which is the highest peak in Hampden County and fifth highest peak in Massachusetts at 1,780 feet. The group will follow a section of Unkamit’s Path, to the top of Round Top Hill which is a grassy open summit with spectacular 360 degree views. Hikers will stumble upon all three Geological markers and sign the guestbook in the cache. 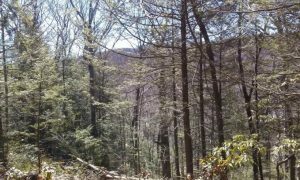 Keep an eye out for shagbark hickory trees, high elevation birds and spring wildflowers. This peak is not easy to get to, there are 400 foot elevation gains to the summit, be prepared for steep uphill climbing for the first 20 minutes. Directions: Meet at the entrance of the Griffin Brook Road parking lot in the Chester Blandford State Forest off of Round Hill Road. Take Route 20 or Route 23 to Blandford Road in Chester (do not take Round Hill Road from route 20) turn onto Round Hill Road (Blandford Town Line side), take a left at the cemetery and take the first right into the parking lot. You may park in front of the cemetery as well. Plan for two hours to complete the loop. The trail is well blazed, and a footpath in some sections. This event is weather depending. Please bring walking sticks and spikes if there is snow on the ground. The terrain is rocky, has roots and some large boulders in some sections. There are no facilities at the trail. Maps and bottled water will be provided. Hike is FREE, donations are welcome!